Tibet is considered to be the Holy Land attracting many domestic and international visitor. For travellers it was a land of treasure and riches, for its peculiar geography features and unique natural scenery, featured ethnic culture and characteristic local residential customs and habits. Tibet, the roof of the world, is located on Qinghai-Tibet Platean in the southwest frontier of China, with the average elevation of over 4,000 meters. For centuries this mysterious Buddhist holy place, is locked away in its mountain fastness of Himalaya, and has exercised a unique hold on the imagination of the west. Welcome to check out our travel guide to Tibet. Don't hesitate to contact us if you plan to travel to Tibet. We will provide the professional advice, individual itinerary and excellent travel service. Tibet is without doubt one of the most remarkable places to travel in China. It offers fabulous monastery sights, breathtaking high-altitude treks, stunning views of the world's highest mountains and some of the nicest people you will ever meet. The best starting place to Travel Tibet is the capital city Lhasa, where you can find the famous Potala palace. Shopping in Tibet is a great experience with an abundance of interesting and unique items and souvenirs to buy. The famous Barkhor Street in Lhasa is renowned for its authentic vendors selling traditional wares such as hand woven blankets and beaded jewelry. Tibet has a host of guided groups available, which take you across the spectacular land, stopping off at all the main travel attractions and sights. Transportation to and from Tibet is now very convenient and easily accessible. There are many straight flights heading there from most major cities in China. Or You can take buses, although the newly finished Tibet Railway Line is a memorable experience which travels through picturesque landscape and terrain. Undoubtedly, the best time of year to travel Tibet is between June and August. However, there are two things you have to take into account when traveling there. The first is the political situation, which results in that you need a separate travel permit to get in, besides your China visa; the second advice is on altitude sickness. The most convenient way to travel Tibet is still to find a reliable travel service to arrange everything for you. 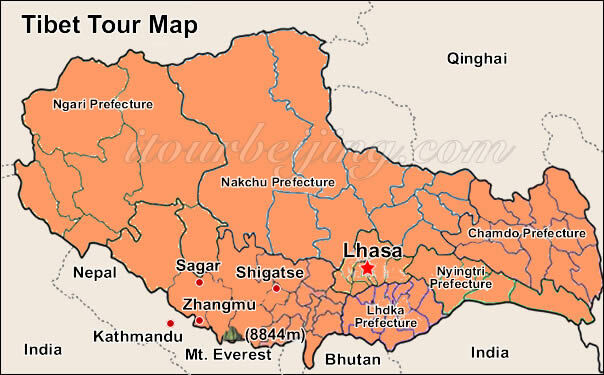 My wife and I plan to travel to Tibet in Mar. But it is said that Tibet may be closed to foreigners till April. Is that true? And do foreigners have to get a permit to Tibet through a travel angency or deal with it ourselves? Thanks very much for your kind help! Name:Re: Trvel to Tibet in Mar.? No official news is issued and everthing is unsure. It is better to get the Tibet travel permit through Travel Agency or you can join in a group in which the service is included. I want to experience a different Tibet. When is the proper time for me to go there? Thanks for asking. I recommend you to go there during Tibetan New Year so that you can experience a different New Year. Tibetan New Year is the most important festival there. On that day, Tibetan families will get together and pray for a better year. The traditional Tibetan New Year is known as Losar, which starts from the first to the third day of the first Tibetan month. Preparations for the happy event are manifested by special offerings to family shrine deities, painted doors with religious symbols, and other painstaking jobs. People eat Guthuk (barley crumb food with filling) on New Year’s Eve with their families. As a convention, there will be a Guthuk stuffed with a different filling to fool someone in the family. Hi, I want to visit some Tibetan customs. Do you have some special recommendations except the Potala Palace? I think Ta’er Monastery is a great choice. Ta’er Monastery, Kumbum Monastery in Tibetan language, is the birthplace of Tsong Kha-pa, the founder of the yellow sect, is one of the six major lamaseries of yellow sect in Tibetan Buddhism. It is 26km away from Xining, the Capital City of Qinghai Province and it was firstly built in 1379. It is a garden-like architectural complex of blending Han and Tibetan architecture.